Santouka is a Japanese based ramen chain that has outposts all over the world; Harvard Square is the first New England location. I went to Charles and Sumita on a Monday night. Unlike my other ramen experiences, we were able to walk in and get a table without waiting. The space is industry and sleek; a stark contrast to the homey feel of Yumewokatare. They claim to still be in the soft opening phase, so there is only a limited menu available. 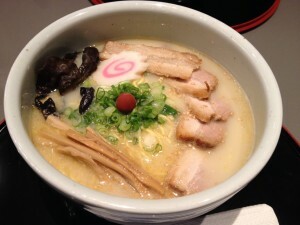 I had the Shio ($11.25) which is their signature ramen. It is a mild and creamy soup seasoned with salt. I opted for the 5 addition pieces of pork belly ($4). You can upgrade for a dollar more, or down size for a dollar less. I liked my noodles; they were yellow and springy. The pork was also tender and unctuous. My only complaint was that it was a tad salty. Shio means salt in Japanese so maybe that was to be expected. The menu prices seems high, but Harvard Square real estate is costly. Overall, I prefer Yumewokatare, but it's hard to justify waiting in line for 45 minutes when there are alternatives. Error running style: S2TIMEOUT: Timeout: 4, URL: gltsoi.livejournal.com/217833.html at /home/lj/src/s2/S2.pm line 531.